Inlays and onlays are used to repair decay and fractures on teeth that are too broken down for a filling, but don’t need the full coverage of a crown. Inlays and Onlays are made from tooth-coloured porcelain, composite resin or gold. Inlays are custom-fitted to repair decay or damage in the ridges of the teeth. Onlays, also custom-fitted, are used to repair decay and damage that occurs on more than one cusp (point) of the tooth. 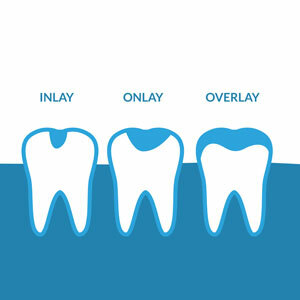 Similar to a crown, inlays and onlays are custom made in a dental lab and usually require two appointments to complete.